Volatility Is Coming: Is Your Low Volatility Strategy Ready? You saw it in February and again in October. Large and quick market drawdowns hit the S&P 500 Index leading it into temporary correction territory in both instances. Yet, low volatility equity strategies had mixed results during these brief, but significant, sell-off events which led to some disappointment among investors. After all, the main reason investors seek a low volatility strategy is to have some equity participation with downside protection. So what exactly happened? Is something broken with low volatility strategies? To help us answer that question we use history as a guide. Specifically, we look at the S&P 500 Index drawdown-periods greater than 10% since 1968 and calculate the duration of those periods. We then compare and contrast the performance of low and high beta portfolios over the drawdown periods, over the recovery periods, as well as over the full-cycle. The objective of this analysis is to test the benefits of a naïve low volatility strategy across many equity market drawdown periods to help us better understand the experience this year. We summarize our findings in Figure 1 below. 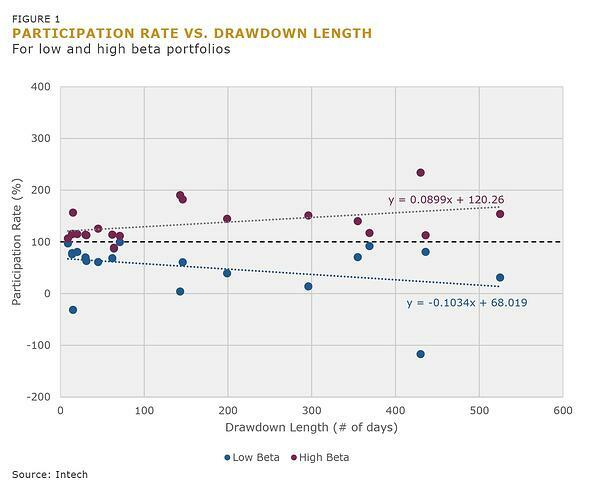 We plot the participation rate, expressed as a capture ratio, of both high and low beta portfolios against the length of the drawdown period in isolation. For example, values less than 100 indicate a portfolio participates less in the drawdown and outperforms the broad market. 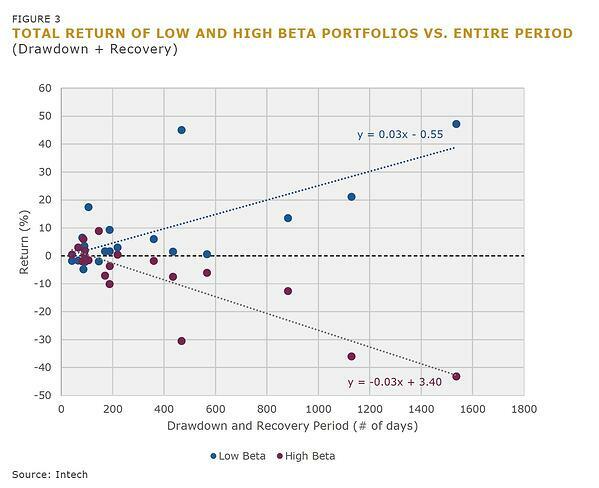 We find that the low beta portfolio tends to outperform the higher beta portfolio during market drawdowns on average. We also observe that the downside protection provided by a low beta portfolio tends to increase with the length of the drawdown. In other words, the low-volatility strategy tends to perform its best when the length of the peak-to-trough decline period increases. But, when drawdowns occur over very short time horizons, there are some instances when low beta portfolios participate more in the drawdown as seen above. Back on Jan. 26, the S&P 500 Index started to sell-off. By the time it stopped on Feb. 8, just 10 days later, the index had dropped more than 10% and thus entered correction territory, signaling investors had turned pessimistic about the market. But just as quick and deep as the sell-off was, the market recovered. What happened? The market had been in a period of extreme calm but investors suddenly became worried the roaring economy, boosted by tax cuts, would experience rising inflation. It took very little for the market to storm back up as investors’ risk appetite quickly returned. And so low volatility strategies didn’t get a chance to shine. We observe this phenomenon in Figure 2 below. Here we plot the participation rate, or capture ratio, of the same low and high beta portfolios in the recovery portion of each 10% drawdown for the S&P 500 Index historically. In this case, a value less than 100 indicates less participation in the market recovery and underperformance relative to the broad market. We observe that in most cases low beta portfolios tend to lag the high beta portfolio in quick market recovery periods, as we saw in February. However, the longer the market takes to recover from a drawdown the upside capture ratio of lower beta portfolios tends to increase, and the greater the participation in the market recovery. So what about the month of October? During the month of October the market also experienced heightened volatility, but in this case, investors tended to favor more traditionally defensive sectors as the market plunged. For example, the only sectors that posted positive returns in the S&P 500 Index were the defensive utilities and consumer staples. Low volatility strategies benefitted from the selloff of riskier securities during October and performed better in this volatile environment despite the fact that it also occurred over a short period. This year’s market corrections occurred over extremely short time periods and provided examples of how short-term market events, which are often led by idiosyncratic, stock-specific effects, can serve as both tailwinds and headwinds for low volatility strategies. 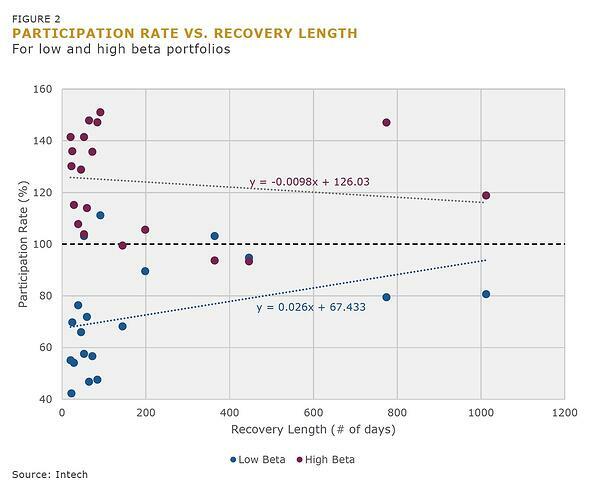 However, our analysis shows that low beta portfolios tend to outperform high beta portfolios over the combined drawdown and recovery periods, or full cycle, benefiting from compounding effects over the long term. In addition, the performance of the low beta portfolio tends to increase with the length of the full cycle as observed in Figure 3 below. The previous experiment is purposely naïve but is meant to illustrate that the benefit of a low beta strategy cannot be measured over a short period of time. A low beta strategy tends to do better when the market sell-off is persistent and not just a few-days event. Additionally if held long enough it has the potential to outperform even if it tends to lag in periods of market recovery. In practice, the outcome for a low volatility strategy is not just driven by the duration of the different volatility regimes and the direction of the market. The nature of the exposures driving the market on the way down and on the way up will also influence the outcomes over time. Moreover, many defensive strategies available to investors use sophisticated optimization techniques, and combine both alpha potential and downside protection, which create significant differentiation in positioning and outcomes within the universe of defensive strategies. In other words, all defensive strategies are not created equal. At Intech, we tend to implement different active defensive strategies, including low volatility and adaptive volatility in an attempt to improve upon a naïve low volatility strategy. Our defensive strategies tap into a proven alpha source of rebalancing and find the better tradeoff between risk and return in an equity portfolio by adapting to varying volatility conditions. Overall, our approach to defensive investing tends to result in greater consistency of outperformance and higher risk-adjusted returns realized by the investment capital.